When i opened my mail today i was surprised to see a Rajasthani Thali for this month's South vs North Challenge an event owned by Divya Pramil,seriously i was very happy to make some Rajasthani foods for today's lunch. 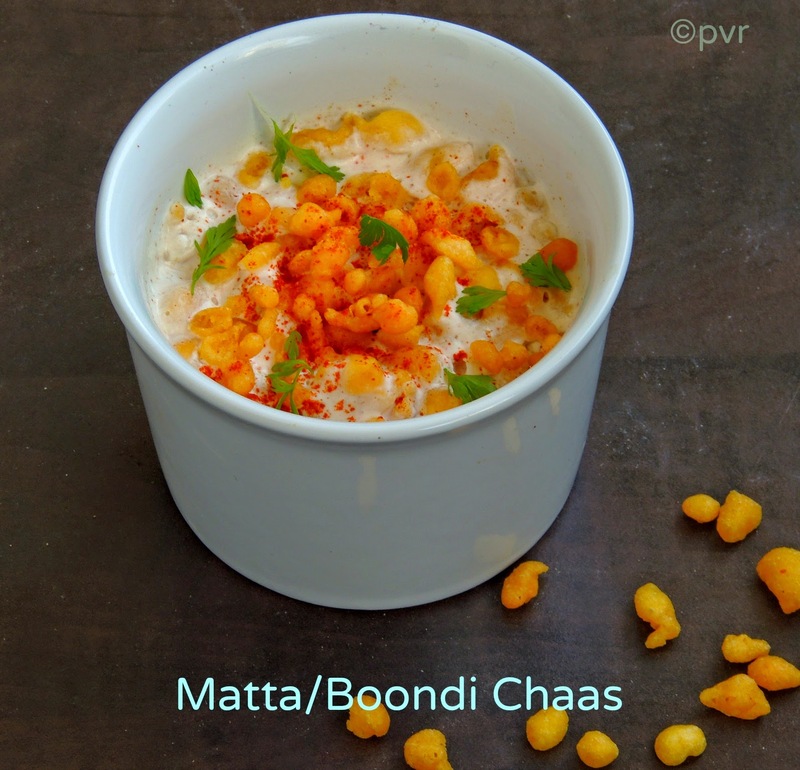 Every first of the month, i'll be posting a North Indian dish as am a part of the famous South vs North challenge. The motto of this event is to exchange an Indian recipe between two teams. One team is Southern team (bloggers born and brought in South India) and the another one team is Northern team (food bloggers born and brought in North India). Every first of a month, a blogger from each team will challenge a recipe from their origin and the opposite team have to cook the recipe challenged by the other team. For our this month's challenge, Manjula Bharath of Desi Fiesta challenged the southern team with her Rajasthani Thali while Sowmya of Nivedhanams challenged the Northern team with a fingerlicking delicious Vendhaya Keerai Paruppu Urundai Mor Kuzhambu. As per Wiki, Rajasthani cooking was influenced by both the war-like lifestyles of its habitants and the availability of ingredients in this arid region. Food that could last for several days and could be eaten without heating was preferred by them. Their food cooked in pure ghee is famous for it's mouth- watering aroma. Rajasthan's tastiest curries are based on the use of pulses or gram flour. Dry fruits, spices and yogurt are used in many delicacies. Rajasthan can also boast of a vast array of savouries and sun-dried snacks. 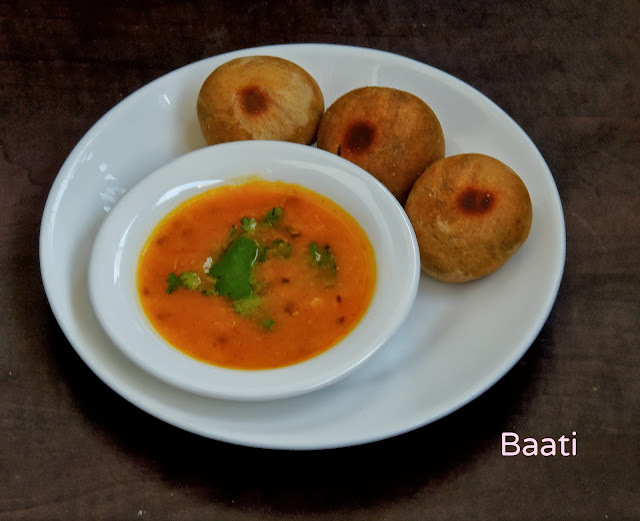 Be it dal baati and churma or missi roti , one always ends up licking his fingers. Coming to today's Rajasthani thali, Manjula shared 10 dishes, i prepared 9 dishes out of 10 and left one coz of the sun dried moongdal wadis, yep i dont get these sun dried wadis here and the weather is too nasty to make some at home itself.Thank god, i picked yesterday goond aka edible gum, also prepared the dal with yellow split moong dal instead of the green split moong dal as Manjula suggested, apart from it i followed the original recipes as Manjula shared and we had a Rajasthani feast today.I prepared boondis, bajra flour and yellow corn flour at home itself, eventhough i get them easily in Indian groceries.Since the motto of this event is to releve the challenge every first of the month, sometime we dont know about the ingredients we must need for the challenge. Obviously i dont hesitate a second to make few ingredients we might need for the challenges at home itself. Mix the wheat flour, salt and ghee, make a stiff dough (add water if need). Divide the dough as equal balls,roll it. Preheat the oven to 375F, bake the batter for 15-20minutes until they turns brown on the surface. Take the baked baatis out and dip it in pure ghee if you are health nut like me, just brush them with ghee while baking. Heat the oil,let crack the cumin seeds; add the asafoetida powder, red chilly powder, ginger garlic paste, turmeric powder and cook for few minutes. Add the cooked dal with enough water,bring it to boil. Finally add the garam masala and let it cook in low flame for few more minutes. Sending this moongdal to my own event CWS-Yellow moongdal hosted by Manju. Combine all the ingredients given for gattas and knead as a firm dough by adding enough water. Divide them as 7-8equal balls and shape them as rolls, boil enough water in a pan, add the rolled gattas and cook for 8minutes. Drain the water and keep aside the gattas. Combine the beaten curd, gram flour,curry leaves with a cup of water, whisk well and keep aside. Heat oil in a pan, let splutters the mustard seeds,cumin seeds, asafoetida, once the seeds cracks add the turmeric powder, chilly powder and saute for few minutes. Add now the curd mixture, again a cup of water ,salt and bring it to boil. 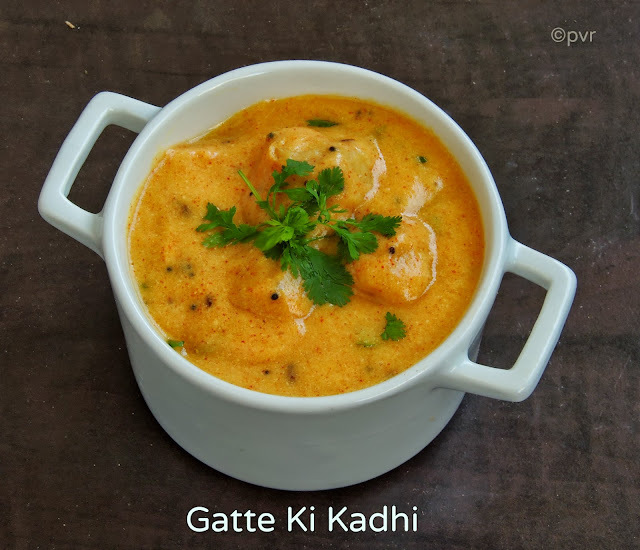 Keep stirring and cook until the kadhi starts thicken slightly, finally add the already prepared ghattas,bring it to boil,put off the stove. Add the chopped coriander leaves for garnishing. Take the flour,salt in a bowl,make a well in the center, pour slowly small amount of water and start kneading the millet flour, add water if needed to bring the flour together. Make a smooth dough, dont add water else ur dough will turn sticky, take more attention while adding the water to the millet flour. Heat the griddle in a medium flame. Divide the dough into equal balls, dust the balls with the millet flour and roll them gently as medium circle. Transfer the rolled roti to the hot griddle, once you see the tiny bubbles on the surface of the rotis, flip it and drizzle ghee on the surface,spread well over the roti. Flip the roti again and drizzle again the ghee and spread it over the roti. Cook on both sides until the roti turns slightly crispy. Combine all the ingredients to form a smooth dough. Cover and let it side for 10minutes, divide the dough as equal balls. Flatten them by using the fingers and palm. 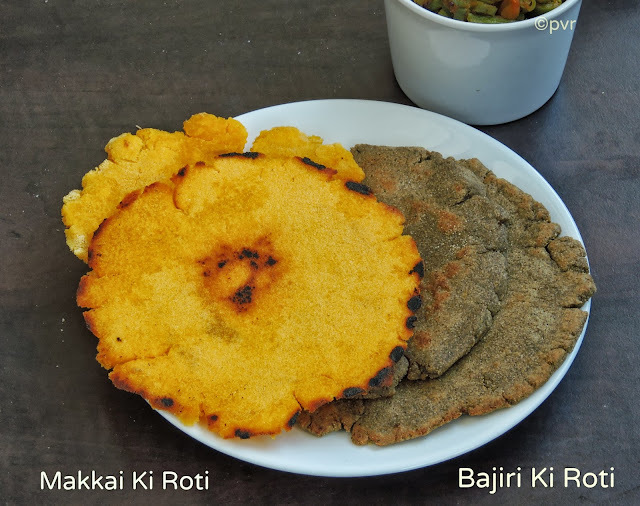 Dust it with enough flour and press it between two plastic sheets as flat roti. Heat a tawa, transfer it to the tawa,cook on both side until they get cooked. Heat the oil in a pan, let splutters the mustard seeds,cumin seeds. Add the clusterbeans, long beans,capscium,cucumber, french beans,salt and tomato, cook the veggies covered until they are half done. Add the turmeric,chilly powder,coriander and cumin powder,mix well and cook until veggies gets well cooked and coated with spice powders. 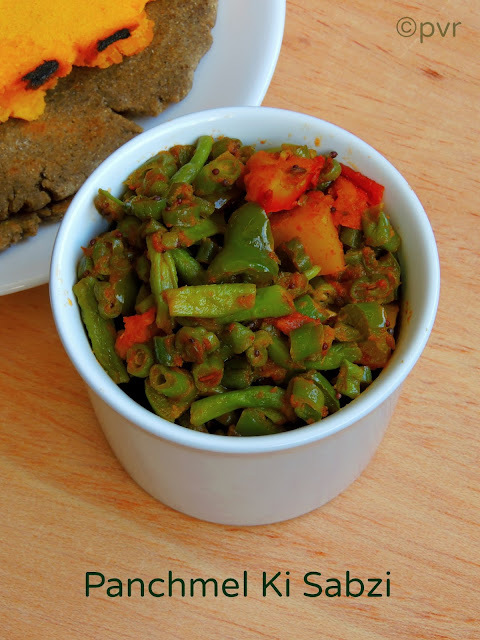 Dont overcook the veggies and serve with rotis. Take all the ingredients including boondhi and blend till smooth. Finally add more boondis to the chaas and serve chilled. Heat the ghee, fry the ediblegum until they gets puffs and transfer it to a paper towel. Now add the fried edible gum,roasted wheat flour,cardamom powder, powdered sugar and mix well. 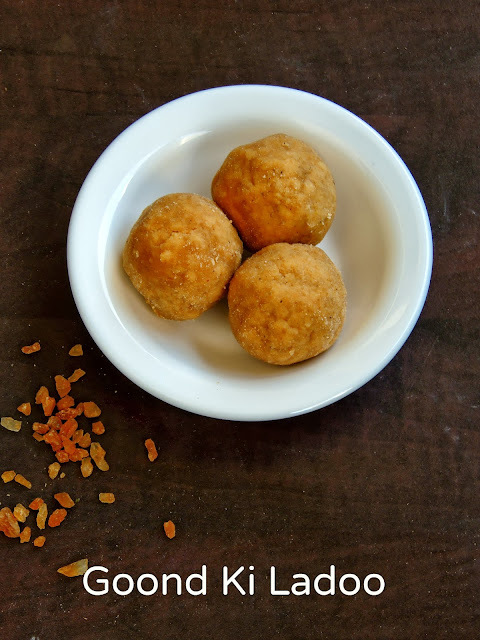 Make medium sized ladoos from the mixture, if its hard to make balls, add 2 or 3 tablespoons of melted ghee and make balls. Take the milk,whipping cream,salt,sugar as per need, water, soaked saffron milk and blend together until they turns smooht. super priya.wish i could have some.lovely clicks.wonderful platter. Wow Priya! There are no words to describe this wondrful Thali. And as always you are the first to finish. Great. All the dishes look fantastic. Woo woo wo! So many things in one day ! Hats off to you , you are incredible. Rajasthani thali makes me craving to pick all! you got to be kidding me.. you posted on day 1 itself..and what a spread.. hats off Priya.. no wonder you win the fasted post every month.. I guess divya has to come up with a fasted after Priya award.. great enthusiasm... hugs! 'Tu Si Great Ho', Priya akka. Hats off to you and your effort. I am just spell bound now, how amazingly you made the whole thali within this few hours! Kudos!!! u r great priya :) cannt explain the passion towards the food and recipe :) u proved once again :) great attempt ! loved every recipes ! How did you even manage to create the whole thali so soon! I think I saw the announcement post at Manjula's space just a few hours ago :) It's just amazing! Oh. Priya!my dear,searching words to express . looks extremely delicious..! You are the Kitchen super star. Wow Akka.. you finished the challenge already?? Looks like a delicious and nutritious meal.. This looks so inviting! Thali is my favorite and this one looks incredible! Awesome Priya, and very detailed post. Great clicks!! What an awesome spread.I am feeling content just seeing the pictures. nicely done platter. so tempting. Oh my God.. So quick.. How you completed so many dishes ? You have some magic akka..
wow..U R Awesome Priya! no words absolutely a delicious spread and u have done it in short time that too using homemade flours/booondis...great effort...love all the dishes..can;t wait to try it..
the thali is absolutely fantastic :).. what a wonderful spread.. So happy to check out your latest post, Priya! It's been a while since we've visited each other's blog! 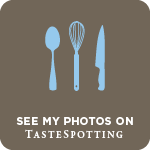 Love all the amazing, and creative droolworthy delicious dishes, and desserts. 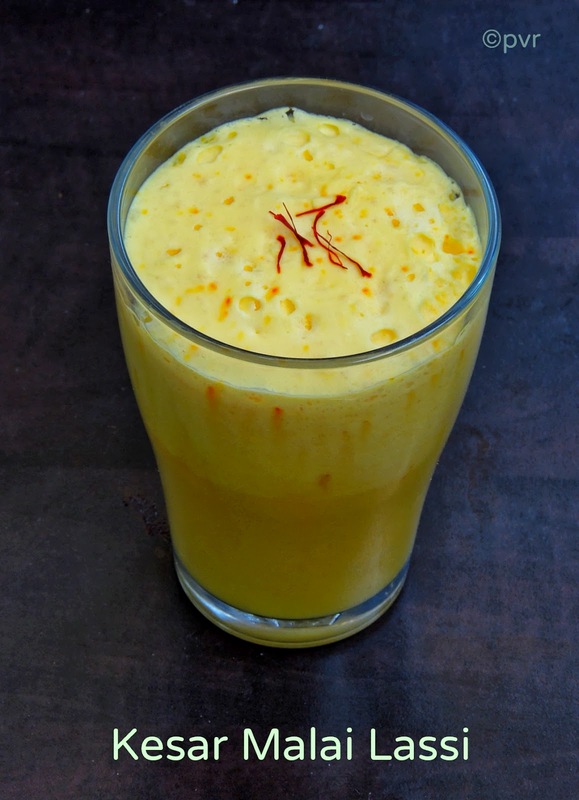 Love the Moong Dal, especially and the refrshing yummy Lassi! brilliant stuff ! Wish I could eat the whole thing ! Awesome platter.I love Rajasthani cuisine and your thali looks perfect. Great going. Priya, can I come to your place for lunch? 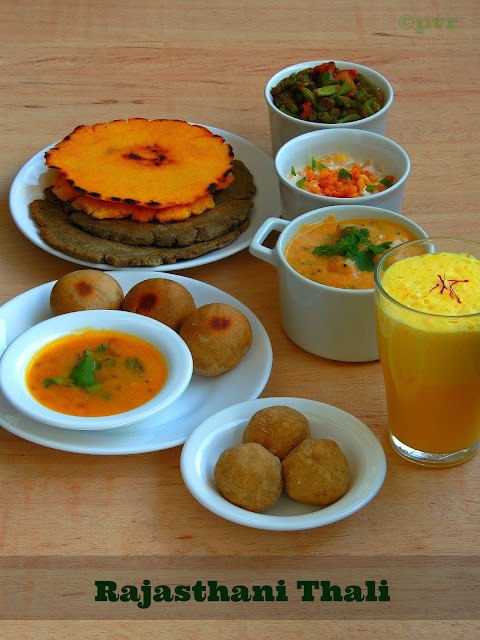 That thali looks wonderful and dal-baati is my favorite Rajasthani food. Really Priya, you are great. Very inviting and tempting platter. I am amazed at ur energy level :) Just in a day, u did everything and that too looks neat & very very inviting !! Lemme know ur secret.. I definitely need some tips !! Wow this is amazing. Looks delicious. The thali looks very delicious and inviting. I like these items and most of them I like Rajasthani Food Thali and I have visited so many times. Thanks dear you have posted this nice blog and your explaining way is awesome.